I've had some great feedback on the last episode, saying that it was my best episode ever. I suppose thats because the others set the bar pretty low eh? I hope I don't disappoint you with future episodes, this one included, like a roller-coaster, after the big increase in perceived quality, its all downhill from here. I was mentioned on the Animal Rights and Wrongs radio show. Each week, Debra and Eric talk about animal welfare issues, I subscribe to the podcast version which I'll link to in my shownotes. We might not agree on how to best help animals, by sticking to Animal Rights, the Abolitionist view, or Welfare Reform, but it was nice to hear someone mention my show. 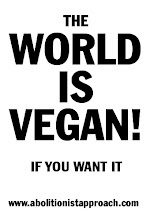 Its nice to hear Abolitionist Veganism being talked about. Heres my mention from the last episode. I like that Eric obviously had trouble with the long name of my show. Chris Noaro was mentioned as thinking it was a GOOD thing that cutting through an animals brain was seen as "humane", Chris used to support my show, he even made a bumper for me , but later, he disagreed with promoting Veganism as a moral baseline, among other things. I really don't think its a good thing to consider some ways of killing animals to be quote "humane", I think it has nothing to do with making people think about Veganism, that all animals should not be hurt whenever possible. The idea of "A Knife Through My Brain isn't Humane" was mentioned by our friend Sam Tucker on his show, Sam helped me by designing the pictures you can see on my blog. You can find Sam's radio show, Food For Thought, at fftradio.wordpress.com. On another episode of Animal Rights and Wrongs, Paul Watson, of Sea Shepherd was interviewed. Paul Watson mentions that Japan kills and eats more animals that Australia or New Zealand, I think its a fair comparison, whales are no more special than my little friends, a family of chickens living in my backyard, and about the number of animals killed for Japanese consumption, why, of course they kill more. The population of Australia is roughly 20 million, the population of New Zealand is roughly 4 million. Ok, according to World Bank, the population of Japan in 2008 was roughly 127 million people. Wow, that blows my mind, people talk about overpopulation, but its hard for me to imagine living here in New Zealand, where the whole country is half the size of New York city alone. Even if you put Australia and New Zealand together, our population wouldn't even match 27 million, let alone 100 and 27 million! Even if there were slightly more Vegans in Japan than the other countries, it should be obvious that more meat and other animal products would be consumed in Japan. Watson believes there can be no quote "humane" way to kill a whale, what? If you honestly believe theres a way to quote "humanely" kill seemingly every other animal thats used for our pleasure, why not whales? If it could be considered "humane" to cut through a lobsters brain with a big knife, why not a whales? I'm sure an arc of plasma could zip through a live whale, even instantly cauterizing the massive wound. If the issue is treatment, rather than the killing itself, then isn't that acceptable as "humane", if its supposedly over in seconds? His other reasoning is that whales are endangered, that there are not many of certain species of whales. Well, some crazy New Zealand farmers would have you believe they have a solution to that problem. Theres talk of farming New Zealand endangered species such as Weka, because growing them for meat would create more of the animals so they wouldn't be endangered anymore. I mentioned this on Episode 17, Get Some Kiwi In Ya. If Watson believes the only thing wrong with killing whales for meat is that they are fairly rare, then surely, he would think it were moral to farm them for their meat, since it would create more of them? I hope Watson doesn't ever meet these farmers, or we might have massive whale breeding farms out at sea, perhaps the people working on these farms would be called "sea shepherds". Also mentioned on Animal Rights and Wrongs, was that Loren Horsley, of Eagle Vs Shark fame, was at the Pig Vigil, protesting so called "factory farming". On her Wikipedia page, theres no mention that she's vegetarian or vegan, I suppose she agrees with eating quote "humanely killed" animals, since she visited the protest against "factory farming". I'm reminded of a scene from Eagle Vs Shark, where her character Lily works at a burger shop, and she mentions "the crazy burger". Well, it seems KFC have seen Eagle Vs Shark, because, at least overseas, they have sell the "Double Down" burger. This awful sounding "Double Down" is just fried chicken meat, bacon, TWO kinds of cheese and the "secret" sauce. No bread or lettuce at all. I believe in America, something like a Big Mac or Whopper would be called a "sandwich"? We call them burgers, after all, its not "Sandwich King". In the case of this "Double Down" though, could you possibly consider something without even bread to be a sandwich? Heres an American ad for the Double Down, they seem to focus on stupid people as the ideal consumer of such a disgusting burger. Continuing with the theme of "lets market this at overweight idiots, only they would buy something this stupid", Campbell Live covered some New Zealand wannabe fans of the Double Down, remember, its not sold here, knockoffs were made and tested. In that clip, the two mention their size, they are "big boys" and they "need" a Double Down class burger to be satisfied. Lets ignore the fact that this thing isn't even sold in our country, they need it, they have always needed it. I suppose its like my Apple addiction, the iPad is STILL not sold here, and its driving me crazy! I was seriously considering importing a "graymarket" iPad, like how I got my iPhone about a year before it was sold here. I would be one of those crazy people who camp outside Apple Temples, I mean, Apple Stores, to be one of the first to buy the new iProduct. KFC is a brand of a giant multinational corporation called Yum! Brands, I preferred the older name of "Tricon Global Resturants Inc, it sounds like one of those evil Megacorps from scifi movies like Robocop or Alien, when one enormous corporation controls everything, making food, guns, stealth fighter jets….now renamed Yum! Brands, its sales are over 11 billion US dollars a year worldwide. Yet, the two typical kiwi guys in the clip were pleading "KFC man, please bro, bring the Double Down to New Zealand, we need it". KFC is not your "man" OR your "bro", its not a buddy you can borrow a few dollars off. Just try visiting your local KFC, and begging for another free hit of the Double Down, its a corporation, a business, they want to continue being part of "Yum!" Brands, bringing in over 11 billion US a year, mostly by selling greasy hunks torn from animals. Back to the "big boys" who "need" the Double Down, I'm also somewhere about 6 feet five inches tall, almost 2 metres tall, and I'm more muscular than either of the guys in the video, but I certainly don't need a greasy mess of fried chickens and slimy bacon with cheese dribbled down the side. What an incredible statement to end on, most interesting is that the person arguing that Humans SHOULD kill other animals, because we're more special than they are, would seem to believe that a human life is more important than a Chickens life. Well, I don't know if I want to rank lives, I mean, is it two chickens to a cow or something? Its reminds me of that awful "black people are three fifths as good as white people". If the host also agreed that chickens and other nonhuman animals are not as valuable as people, and also that America is the quote "greatest nation on God's green earth", does that mean that I as a New Zealander am worth less than he is? I've always found the idea of one country being superior outrageous, and especially so if I'm considered a second-class life form for not being born on the same rock as some right wing radio host. Being overly patriotic is not limited to one country of course, here in New Zealand, theres the similar term of "Godzone" , taken from "Gods Own Country". As in, New Zealand is so amazingly beautiful, that if there were Gods, they would live here. Interestingly, the Wikipedia page on the term suggests other countries and states have ripped off the phrase, which has ALWAYS been known to be a New Zealand term, how could there be more than one "Godzone", unless, I suppose, these Gods could live in every self proclaimed Gods Own Country at the same time. I don't know, maybe they can. I've found some news stories I'd like to cover. In the news here is how Duck season is rapidly approaching, I think I've already heard gunshots from the local waterway. "Licenced gun owners in the southern region own more firearms than any other part of the country, according to police records That number continues to rise as keen hunters buy new guns in preparation for the annual duckshooting season starting next month. ... Senior Sergeant Dave Raynes, of Invercargill, agreed. "There are certainly a lot of shotgun licences around – it's one of our national sports down here, I'd say….Mr Fiveash said it was not just the men getting involved in the sport – about 10 per cent of sales during the past three or four years had been to women." The story ended with a quote from a Gun store manager saying "you can never have too many guns", ugh, well of course HE would say that, wouldn't he, but its a scary thought. The Southland Times also had about a story about a local slaughterhouse titled "Alliance Mataura gets praise for cleaning up"
Quote "The region's largest employer has been praised by an Environment Southland councillor for its part in cleaning up the Mataura River. Alliance Mataura's phosphorus discharge had reduced significantly in the past two years and Cr Maurice Rodway said the company should be congratulated on this. At an environmental management committee meeting yesterday, Cr Rodway presented a report on his visit to the plant and tour of the treatment facilities. The visit was a follow-up to a report last year on the issue of sewage fungus growth in the river. The fungus was the result of a particular type of effluent the plant discharged." Well, so the Freezing Works, a place where animals are killed had been a well known polluter of the important Matuara River, so when the waste was quote "reduced significantly", they deserve praise? "Thank you for not making as much of a mess as you have always done in the past"? Sounds a bit like giving an award to a slaughterhouse designer. And the last part, some odd fungus was caused by quote "a particular type of effluent the plant discharged"? I wonder what the quote "effluent" was. When you use the term effluent to do with dairy farming, it means, well, number two, cow poo. In the case of effluent here, what could it mean? A particular type of blood or guts? And what are they doing with that now? What, its not just chucked straight in the river, is it buried somewhere? Or is it ground up and sold at Mcdonalds? Perhaps its the secret sauce on the Double Down burger at KFC. I also read a story about a truck carrying sheep having an accident. From the story, "A mob of sheep took an unexpected tumble yesterday when the trailer they were in rolled on a Southland highway. ….An investigation into the cause was continuing but Mr Wakelin believed the trailer got caught in the gravel on the roadside and the slope of it caused the fully loaded trailer to tip. It took about three hours to clear the unit after freeing the stock trapped inside, he said." They took a "tumble", really?, thats how you describe a massive truck rolling over at speed? Imagine being packed in the back of a sheep truck, sheep don't exactly get seats of their own in there, they are all crammed together, and then the vehicle moving at a fair speed rolls over and skids down the road. Its more than a "tumble". And, "the stock trapped inside", I wonder what state the animals were in. At first I thought the newspaper should have mentioned the fate of the animals, but, to be honest, they would have either been going to another farm, or perhaps a slaughterhouse, they were as good as dead already. My second last story, an Invercargill teenager was asked to imagine the scenario of Auckland Island pigs "running rampant" on Dee street, Invercargills main street as part of her speech exam. She received a very high grade, and thanks the pigs for her success. These Auckland Island pigs, after originally being left on the remote island as potential food for shipwreck survivors, were found to be quote "disease free" and so have apparently become quite valuable for biotech purposes. Of course, as an introduced species, the Auckland Island pigs HAD to be exterminated, we cant have introduced species on a rock in the middle of nowhere eating New Zealand native plants you know, although some were quote "rescued" for biotech reasons. Living Cell Technologies has setup at least one trial farm near Invercargill where I live to breed these animals. I thought the media was meant to be fair, yet the issue of keeping animals alive in a sterile room, until they are harvested for their organs is never brought up, all thats mentioned is how great it would be for the people receiving the treatment, and all the jobs that will be created. I seem to be the only person in my city outraged about this, some time ago, I sent a letter to The Southland Times about the one sided reporting on the issue, and received a reply from the Chief Executive of the company using the pigs. "...They are housed in environmentally controlled facilities that give them a very comfortable existence and protect them from the viruses that modern pig herds have. They each have their own pen, which is a large area so that the pig can move around and lie out full length in any direction. They are let out of their pens twice a day for their exercise, to play and socialise with the other pigs. The pigs are given toys and the staff spend time grooming, bathing and giving attention. The pancreas of young piglets are taken to obtain cells that produce insulin. The piglets are anaesthetised for the pancreas to be removed and they are then humanely euthanized while still under . In a separate manufacturing unit the cells are processed into gel capsules and the product, Diabecell"
A lot of fancy words there, they knock out the piglets, and kill them to make valuable pills, thats a much simpler way of putting it. I don't really care about how amazing it is that pigs are given enough room to lie out in any direction, imagine having that freedom, or that they get let out for exercise twice a day. Nor do I care about the toys and the attention given to the animals by the staff. The fact is, these piglets, as in, baby pigs, are kept alive to be killed for their pancreas. I suppose they are kept alive until they grow to a usable size, no longer than needed for their pancreas to be "ripe" for the picking. Actually, when you think that the staff act as caregivers to the animals, playing and washing them, and then take the piglets away to be killed…its even more sick. I wonder if they talk to the piglets, "hey billy, guess what big guy, you've lead a good, long life, although you are still a piglet, you had plenty of room to stretch out in any direction, and you got exercised not one, but TWO times a day! now its time for us to kill you for an organ that makes up a tiny percentage of your body, we make that into pills and sell those for lots and lots of money, and the rest of you gets thrown away, or perhaps sold as meat!" I don't think it matters that these pigs could be considered to be "treated well", they shouldn't be kept locked away from the rest of the world and they shouldn't be killed for a single organ. The use of animals for potential medicine has never sat well with me. I think most people are becoming increasingly aware of how different humans and nonhuman animals are, just because something works on pigs, does not mean it will work on people. Our bodies are very different when it comes to drugs, just think about how a simple thing like chocolate is very toxic for dogs. Oh, the scientists who use animals might say, if we don't use animals, maybe we wont be able to cure cancer, well, if sacrificing animals to save other, richer animals with more money is acceptable, then we really should be rounding up starving orphans from third world countries to use them, right? I mean, maybe cells from pigs are sort of compatible with our bodies in some ways, but nothing beats the real thing right? We should be harvesting poor people for their organs, to sell to rich people on their death beds. I think its rather obvious that organs taken from people would work in perfectly well in other people, but we wouldn't treat other human beings this way, because it would be highly immoral. If we can live without harvesting organs from slave children, we can live without abusing animals for the same purpose. I think its sad that these Auckland Island pigs will be bred into such a sad life. The mayor of Invercargill has always tried to claim using the pigs in this way as HIS idea, he told the teen who won a speech award that she should visit the two Auckland Island pigs kept at Queens Park, it has sort of a zoo section. To think, perhaps those two pigs, out of the entire species, will be the only ones to live outside, to see the sun, no doubt they are kept fenced into a small area. And they are still the most well cared for members of their entire species, all future Auckland Island pigs might only be kept in sterile environments, to be harvested for a single organ. This leads into my last story, permission has been given to genetically engineer animals in New Zealand. "Scientists have been given permission to put human genes into goats, sheep and cows for the next 20 years, to see if the animals will produce human proteins in their milk. But people will not be pouring the genetically modified milk on their Weetbix just yet - the milk will be discarded. AgResearch won Environmental Risk Management Authority approval to allow a handful of scientists to breed and keep genetically-modified animals at the Ruakura research facility, near Hamilton. The work will begin with genetically modified cows, and could be expanded to genetically modified goats within the next year. The article also mentioned how the animals will be engineered. * Scientists take a piece of human DNA code. * DNA code is injected into nucleus of a cell from a cow, goat, or sheep, sometimes using an inactive virus. * Culture the cell and find out whether it is "working" and able to produce human protein. * Put the nucleus of the cultured cell into an egg taken from the ovary of a dead cow from the abattoir whose original nucleus has been removed. * Put the reconstructed egg into a the uterus of a host cow (non-GM). * GM calf is born. When the calf matures she should be able to make milk with human protein in it." I have no worries about Genetic Modification in theory, I'd gladly take a magic pill that would make me grow Damselfly wings, I mean, who wouldn't?, but I want nothing to do with experiments on animals, or commercial use of Genetically Engineered animals. And this idea of using an egg taken from a cow who was murdered at a slaughterhouse, and putting it into a live animal, sounds just gross, like something from a zombie movie. I often talk to Farmers, both online and in person, and they seem so very proud of how New Zealand is to its farmed animals. They say about how all our animals live on grass, and are not chained indoors, how we have such high standards of Animal Welfare and all that other nonsense. But, it seems the largest farming groups are increasingly moving away from these quote "high welfare" systems, towards what Welfare groups call "factory farming". I think we should all take interest in the Genetic Engineering of animals, it only takes one to get loose, and spread its modified genes throughout the country. 3 News piece on "double down"